Do you remember those cute chipmunk cartoons Chip and Dale? 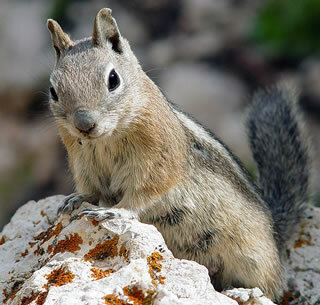 Yes, our cute squirrel friends are in fact part of a huge family of Squirrels (Sciuridae) which also makes them cousins of prairie dogs, the woodchucks, the amazing flying squirrel and both tree and ground squirrels. The Squirrels are pretty widespread too because their kin can be seen all over the trees, parks and woodlands across the globe—Australia, Asia and the Europe. Aside from the famous love of nuts, the facts are these furry friends of ours can also dine on small insects, roots, tree bark, leaves and acorns. It can be noted that when you give a certain type of squirrel tree bark for him to chew, the little guy would just flatly ignore it. Don’t feel bad because some Squirrel species do not have stomachs that break down cellulose (the chemical that makes the tree hard). Squirrels will typically gather and save a lot of their food all year round but this is definitely true when it comes to the autumn time. When you see them collecting all their nuts just before winter it is because they are getting ready for winter and they want to make sure that they have enough food to last them. After they have buried all of their food and when winter comes and goes, the squirrel will wake up out of hibernation and go look for the food they buried! Did you know that their name came was credited from the old Greek word Skiouros? The ancient Greek naturalists find their brushy tails remarkable as the meaning of Skiouros is “shadow tail”. Even though they are generally depicted onscreen as adorable brown chestnut lovers with a large fluffy tail, the Squirrel family’s looks are rather divergent. Some are decidedly dark like the Eastern Gray Squirrel while others sport white stripes on the back like the Indian Palm Squirrel. In fact, there are 200 different kinds of Squirrels worldwide.Now that's a cool squirrel fact! One famous relative of theirs, the flying squirrel has a special stretchy skin called the patagium that extends and helps the animal glide through the air. When it takes its jump, scientists report that it could daringly take the plunge from 150 feet—such an amazing feat for a little guy! Did you know that there is a Squirrel just a few inches bigger than a typical teacup? The one who holds the record of being the smallest in the Sciuridae family is the African pygmy squirrel—which reaches its full height at about 10 centimeters only! How about the longest? Perhaps, the most giant-looking Squirrel is the Alpine Marmot which could size up to a whooping 73 centimeters. But what makes them a family if there are at least one or two similarities among them? Yes, you are right. It’s their chunky front teeth. Unlike our human teeth, did you know that the Squirrel’s incisors grow throughout their lives? Albeit not as prominent as the former, these furry rodents also have keen eyesight that is from their huge, glassy eyes. To easily help their way up a tree, they also have long nails and claws. One of the reasons why they remain cute to human eyes is their fur—which is quite silky and soft to touch. Did you know that despite having perfect vision as adults, baby squirrels are blind at birth? Many mother squirrels can have two to eight babies at once. These young ones must also depend on their caring mother for food and drink (mostly milk) for about a couple of months. After that, these individuals grow mature and can fully hunt for food themselves. Baby squirrels are called kittens and kittens are born only twice a year. Once in the spring time and once at the end of the summer. When some Squirrels live in groups, they exhibit camaraderie. This altruistic (unselfish trait) usually comes off when they feel that there is danger approaching. They produce warning calls to alert their fellow rodents from lurking predators. The one who initiates the calls—yes, this good guy—is likely to be the one to leave last. Hence, his life is put in more danger. Generally all squirrels live in trees, basically in the holes of trunks or even in the treetop in abandon crow’s nests. Squirrels will usually start looking for a nest when they start to mate, which is when they are about a year old. ALL ABOUT SQUIRRELS: Article on What Do Squirrels Eat? © about-squirrels.com. All rights reserved.